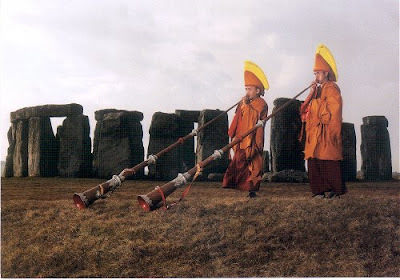 Stonehenge is the setting for this photo of the exiled monks of the Tashi Lhunpo Monastery blowing the Tibetan low horns known as tungchens. In his 2006 orchestral work Body Mandala Jonathan Harvey uses Western instruments to mimic the sound of tungchens. While composing Body Mandala Harvey, who is a Buddhist, travelled to Northern India and witnessed purification rites in Tibetan Buddhist monasteries. Although it could well be, the opening quote is not actually about Buddhism. Sir George Trevelyan (1906-1996), who was a leading figure in the movement for spiritual regeneration in Britain and a champion of the Findhorn Community, was not a Buddhist. He was, for a time, a disciple of F.M. Alexander, who developed the Alexander Technique, an alternative approach to physical stress management much favoured by musicians, and it is to the Alexander Technique that the quote refers. 'left me with a horror, fear, and dislike of the amorphous, slovenly, dishonest, muddled, stupid and narrow-minded "mystic" attitude to life, things and people, and especially art'. Elisabeth Lutyens never did things by half, read more about her in Walking with Stravinsky, and hear conductor James Weeks talking to me about her music in this iTunes podcast. Jonathan Harvey composed an opera about Wagner's unwritten Buddhist music drama, and the Tashi Lhunpo monks appeared in Wagner and the Tantric Orchestra, but not at Stonehenge. That photo is amazing. Thanks for putting it up. At first I was sure it had to be photoshopped, but then realized it is my complete compartmentalization of these two elements of East and West that's the problem. Sure would like to hear a conversation between whatever a Druid was and a Tibetan lama. Interesting connections, as always. But I'd like to point out that while Steiner "created a successful branch of the Theosophical Society in Germany,(1)" he was *founder* of the Anthroposophical Society(2), characterized superficially as a split from the Theosophists. Here in Chicago, we've got a terrific school called the Chicago Waldorf School, testimony to another of Steiner's contributions to the world: an important theory and method of education.